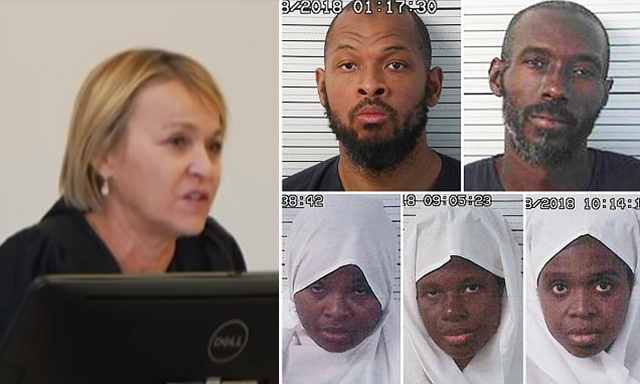 Judge Sarah Backus ordered the release of five suspects accused of running a "school shooting training camp" after one of their attorneys said they're only being targeted because they're "black and Muslim," as opposed to "white and Christian." "Many people here live in unconventional ways," Judge Baukus said Monday. "The NRA right now are telling us that guns are a good thing and that we should be training our teenagers to go ahead and use them, but now that we have someone who's actually do that, and they're not white, and they're not Christian we think there's some nefarious plan," one of the suspects' other attorneys told the media outside the court. The evidence was intended to paint a disturbing picture of a zealous family training for a violent mission against government institutions, New Mexico prosecutors said. The family fled Georgia for a compound in New Mexico where they trained their children in firearms use, according to testimony. A child died at his father's hand during a religious ritual intended to expel religious demons from his body. Eleven more malnourished children were later found on the property. The family believed that once the demons were gone, the boy would return as Jesus four months later and tell his family which institutions to get rid of, a witness said. Those who did not believe "their message" would be killed or detained "until they believed," a teenager on the compound said, according to a FBI agent. But a lawyer for one of the five adults countered, saying the defendants clients were following religious rituals that might be viewed in a different light if they were white Christians instead of black Muslims. [...]Siraj Wahhaj's lawyer said "no one would bat an eye" if the suspects were white Christians accused of shooting guns on their property or practicing their religion. "If these were white people of a Christian faith who owned guns, that's not a big deal because there's a Second Amendment right to own firearms in this country. If these were white Christians, faith healing is of no consequence because we have freedom of religion in this country. But they look different and they worship differently from the rest of us," Thomas Clark said Monday. "When black Muslims do it there seems to be something nefarious, something evil," he later said outside the courthouse. We're living in Bizarro World.